“Mute Density” transplants my tonal work with saxophone ensembles exploring overtone tuning and monochromatic structures into a Big Band format. After a few experiences with the classic “modern” big band Sound, the one so well represented by the modern radio big band, I was left disappointed as to the variety in timbre of the groups and the fact that they seemed to be producing nothing but amplified clichés- ie nothing more than small group jazz with theme-solo-theme rewritten for a larger group with regular jazz voicings, little dynamic range, sketchy intonation attempting to match the piano’s but never succeeding, no extended techniques, and on and on. Perhaps most of all, I was left feeling empty by their sounds. Growing up I had listened a lot to Ellington and Basie. Now these were bodies of sound that really swept me away and if I may cite some differences to the ones today: the guys in these band were not pushing the volume and theirs were starkly individual sounds within the sections (take the Ellington Sax section as an example)–this gave the bands beautiful individual colors which stands in stark contrast to the average flattened saxophone big band sound of today. At first I was reluctant to take on the Big Band form but the band from Lucerne was persistent and so I decided to take a shot and see what I could do with this set up. 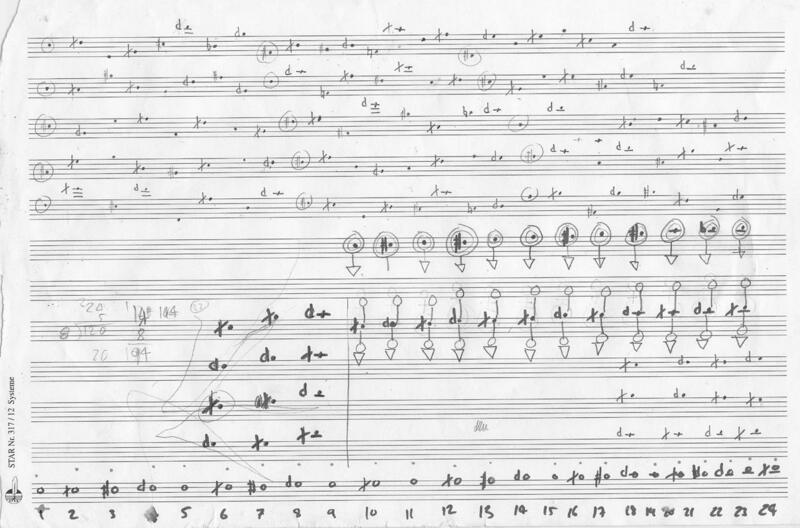 “Mute Density” uses some experimental notation forms which I first experienced playing some of the early scores of Morton Feldman. The results of this can be heard in the movement “Cassiopeian Dancehall”. Other movements use overtone tuning of the first 44 overtones with their respective cent deviations from the tempered scale. In the last few years I had drifted away from using quarter-tones and been more involved with natural overtone tunings. This was my first attempt to use some of these in a larger Jazz setting. In “Sketches of Pain” several 12-tone rows are off-set against each other before the saxophones create a multiphonic carpet and as if often the case in this piece, I allow the individual sections to conduct themselves- making the piece by definition different each time it is performed. Also, my random-chord structures are played by the whole band at various stages in the piece. In “Desire Crossfade”, triads square off against each other beneath a 12 tone row structure. In Cluster Swing the entire band swings away in a cluster block- the result of a dream of mine in which the WDR Radio Big band was playing these clusters whilst strapped on and spinning on an enormous leslie speaker which my foot controlled. The resulting sound was awesome and unforgettable. Although it’s the last piece on the CD, “Tune In” was originally the opener- a piece which gradually arises out of the tuning process to incorporate the first 16 overtones into a chord and serves to “tune in” and “turn on” the band to each other, no “dropping out” needed. 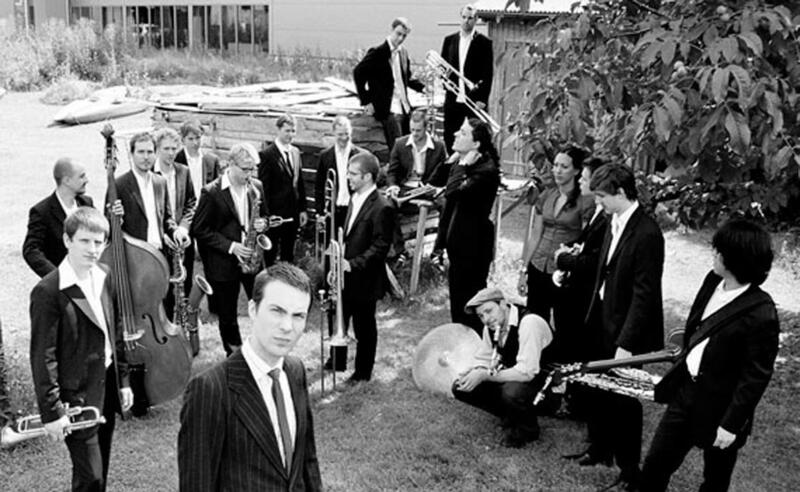 The players from the Lucerne Jazz Orchestra were open for these new ideas and a delight to work with. In no time they assimilated the overtone structures and tuning into their language and we were able to work on fine tuning the band sound. It is to them and their spirit I dedicate this work.